By now you've probably heard the buzz about Tulum - seen a friend's tweets or had your Instagram blown up with their selfie on a beach, selfie in a hammock, selfie with snorkel mask. Chances are you've heard of Tulum - "aren't there ruins there?" - but maybe haven't yet been. It's been discovered, no doubt about it. But it stills feels surprisingly remote and off-the-grid. Tulum is located on Mexico's Yucatan peninsula south of Cancun (but worlds away), It has established itself as the chic place to be for those in search of a blissful and eco-friendly vacation. And the short flight from the U.S. makes it even more attractive as a getaway destination. It's no longer just the "Mayan Ruins" excursion from Cancun or the Riviera Maya. And though it's still a favorite hangout among rustic backpackers, their secret places are being plumped with swanky upgrades like oceanfront yoga programs, luxurious spa treatments, carved hardwood tubs, and plunge pools built into limestone rock overlooking the azure sea. Bus - The ADO (pronounced a-DAY-oh bus from the airport takes you first to Playa del Carmen, then to Tulum. Two tickets for one trip (one for each leg) is cheap and runs under $50USD for the 2 hour trip, though service isn’t always regular. Private Shuttle - The best and most reliable way to get from Cancun to Tulum is to hire a private shuttle for around $150USD round trip. Your hotel will likely make reliable suggestions with similar, if not cheaper prices. Maybe the appeal of Tulum grows as each Cancun generation grows up from the "Party Hearty" wild nights and shots poured down your throat straight from the bottle at Señor Frogs (my head's spinning just thinking about it). 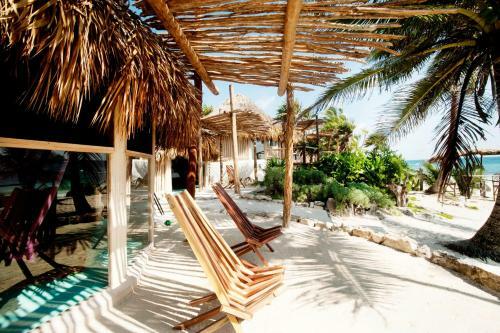 Eventually you outgrow the antics of Cancun, and Tulum offers a slower, more luxe vacation. It's the Sunday morning to Cancun's Friday or Saturday night. There's a lot to love about Mexico, and there are many places around the country where you'll find beaches, delicious food, and nature. 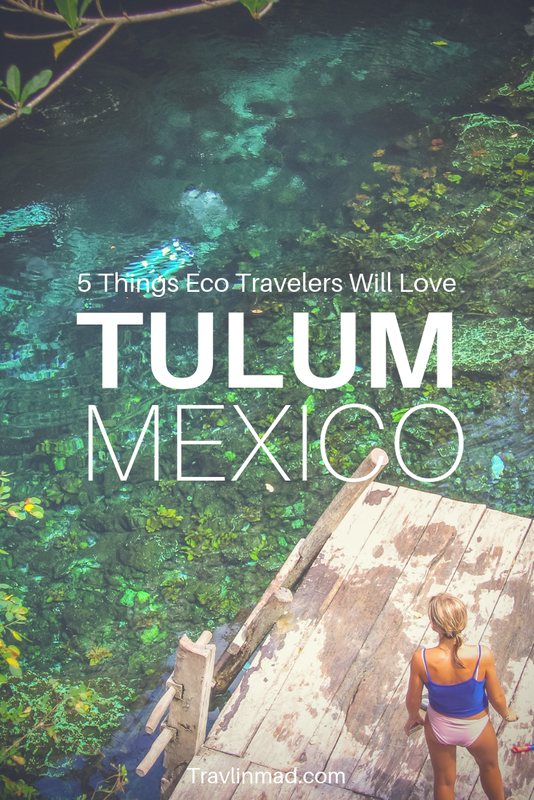 But the great appeal of Tulum for eco-travelers is that you'll find them all right here in one place - those beaches, authentic and inspired local cuisine, cool cenotes, and the Mayan natural world like you’ve never seen. Here are our top 5 things to do in Tulum, Mexico for all you eco- and nature-lovers out there. I know what you’re thinking…OK, so there’s beaches, what’s the big deal? But let's face it, not all beaches are created equal. And we’ve been to some of the prettiest beaches around the world, still ranking these among the best. The beaches near Tulum and all along Yucatan's east coast are some of the most beautiful in the world. Palomino colored sand, softly-packed yet firm enough for walking, a morning run, yoga, or horseback ride. Your seaside view ranges from chic open-air restaurants, small boutique hotels and thatched cabanas, to deserted stretches of sand against small clusters of limestone rock. The sea is unbelievably aqua green - the stuff beach dreams are made of. Hidden, uncrowded beaches are easy to find and accessible, even if you aren't staying on the beach. Many hotels and restaurants offer beach access if you stay and have a lunch, dinner, or a few drinks. They don’t mind the sandy beach wear — which makes packing for the Yucatan a bit lighter. Also, ask locals in town for the best hidden beaches and you're guaranteed to get some good suggestions. Cenotes (sen-O-tays) are simply collapsed underground limestone caves and very common throughout the Yucatan peninsula. For divers and snorkelers, cenotes are one of the Yucatan's biggest attractions. Some of the best cenotes near Tulum are easy to get to. Some are smaller than others, but they can be spectacular, almost other-worldly, and definitely worth checking out. Cenotes are common geological formations in low latitude regions, particularly islands. Central Florida, for example, has a similar underground system of caves - some of them collapsed - formed from fresh water springs running throughout its limestone shelf. But only the Yucatan has such an abundance of cenotes near Tulum. There are so many beautiful cenotes to visit. Cenote snorkeling is so popular in Tulum. Rent a car and travel inland and you'll find several cenotes in quiet, remote places, so they can be enjoyed almost in private. The water is typically crystal clear and refreshing to swim in, making for great photo ops. And of course, diving cenotes is unparalleled, and is the main dive attraction in the Yucatan (check with local PADI shops for required certification). Gran Cenote is perhaps the most famous of all the cenotes around Tulum - it’s also the most expensive at $25 to get in. But it’s got on-site restrooms, lockers available, and beautiful photo ops. It’s located 5km from Tulum Village & 7km from Tulum Ruins. Sian Kaan Biosphere Preserve, a UNESCO World Heritage site, is a massive biosphere reserve in the coastal lowlands south of Tulum. The remote nature and sheer size of the preserve - over 5,200 square kilometers - makes it nearly impossible to tour on your own. Part of the reserve is on land and part is in the Caribbean Sea, including a section of coral reef. Five species of cats are found in the reserve, including the jaguar and puma, as well as the tapir and a wide range of bird species and turtles. The reserve also includes some 23 known archaeological sites of the Mayan civilization. A great way to not only see Sian Ka'an but experience it is to literally immerse yourself in it with a popular tour in the Preserve called the Muyil Float Tour. This guided boat tour takes you through mangroves and over the turquoise waters of the Chunyaxche freshwater lagoon, through miles of channels cut by hand and used for trade by the ancient Maya. The channels run through marshes between the fresh water inland and the sea. There are a number of 'float tour' operators and Sian Kaan tours you can find online or recommended by your hotel, that take you by boat to the inner lagoon past archeological ruins, and other sites of interest. On the way back, your life jacket becomes your own private floating chair when you jump in the shallow water of the Muyil and let the natural current carry you slowly back through the channel to your starting place at the sea. The tours are interesting and unique, and end in the most refreshing way. Surprise! Traditional Mexican food isn’t Tex-Mex piled high with tons o’ cheese, so if you think of Text-Mex piled with tons of cheese, you’re missing half the story. Mexican food is fresh and healthy with lots of vegetables, legumes, and grilled lean meats. In Tulum, you’ll find fresh local street food and talented chefs adding more flair to what’s typical. You'll find no shortage of incredible dining options at the beach and in town. The beach restaurants offer the added toes-in-the-sand or great views, but the town of Tulum is a nice alternative for a bit more liveliness. Pueblo Tulum has some cool little shops - it's well worth spending a day shopping in town followed by lunch or dinner. Hartwood - If it’s fresh, creative, and truly locally sourced you’re looking for, Hartwood is the place. Very inspired local cuisine. Period. Don Cafeto Mar Caribe (town) - Fresh Mexican breakfast, lunch, and dinner. A wide array of options, including some really good vegetarian ones. They have the best pickled veggie condiment bowl, with pickled garlic, carrots, and jalapeños - served to all guests like bread. Yum! Tulum Trattoria Romana (town) - We stumbled upon this place on the main drag, and I had some of the best gnocchi I've had in my entire life. Who knew? The craziest things you don't expect to find! Zamas (beach) - This funky beach hotel and restaurant has been in Tulum "forever" as the locals told us, and their breakfasts are yummy. Try their Huevos Rancheros for breakfast and the Zamas whole fish in salt crust for dinner, among other specialties. Ana y Jose restaurant (beach) - Their hotel is said to be one of the best on the beach. We enjoyed dinner here one night, and it was very good. The fresh fish and ceviche were outstanding, followed by a nice guitar serenade! Mezzanine (beach) - What's not to love about Thai food overlooking the beach? Everything here is outstanding including the service. The Mayan ruins at Tulum are worth the better part of the day. Because not only are these ruins the only seaside settlement established by the Mayans, but the beach there - Tulum Ruins beach - is also one of the best beaches in Tulum, in the same spot! That’s not something you see everyday, anywhere. Indeed, the Mayan ruins near Tulum are situated right on the edge of cliffs that are a shear drop-off to the beach and ocean below. You get the feeling this would have been a very difficult place to conquer. Today though, you don't have to approach from the sea. Access is easy and parking is convenient. The ruins were excavated long ago and are kept well-groomed. But make no mistake, the site is large and like most Mayan sites is rocky in places with uphill and downhill treks. So make it easy on yourself and save the flip-flops for the beach and around town. Here, to enjoy the site, good footwear is a must. I don't know about you, but after exploring a good many Mayan ruins you just start seeing lots and lots of stone. To get the most out of the few hours it takes to experience the ruins, hire one of the guides that wait at the entrance. You needn't be concerned - the guides are credentialed and wear an official badge. The guide we chose, or maybe he chose us, was very knowledgeable and spoke good English. It was well worth the few dollars we paid. The guided tour helped put the history of the ruins in proper context and kept us from going into "stone overload". The view of the Caribbean from the settlement's edge is spectacular. If that's not enough and to get a fuller appreciation of what it must have taken to build Tulum, you can view the ruins from cliffs just a short distance up the coast. We discovered the amazing Yal-Ku Lagoon in Akumal, just a short drive north of the Tulum ruins. Akumal snorkeling is open to the public and the lagoon is stunningly beautiful and easy to access. The crystal clear water is relatively shallow in most places and there is so much underwater nature to see, including tropical fish and turtles, you might end up staying all day. There is a small entry fee and plentiful parking. For more information, visit Travel Yucatan's page on Yal Ku Lagoon. This post contains affiliate links: if you purchase through our links, we earn a small commission at no extra cost to you. If you're looking for the classic Tulum eco resort, eco-luxe cabanas and beach retreats, these are our absolute favorite Tulum beach hotels for rustic and chill beach hangouts. Mezzanine - If you’re looking for privacy, celebs, and a swank vibe, this is your place. An outstanding restaurant is a plus. Check rates and availability. Ana y Jose Charming Hotel - Charming doesn’t begin to describe this lovely eco hotel on the beach. And the restaurant is one of the best in town. Check availability and more details here. Azulik and Zamas Hotel - We loved our stay at Azulik. Right on the beach with a rustic-chic beach vibe, it’s got the most incredible outdoor tubs right over the surf! It’s the dressier sister to more laid-back Zamas Hotel just next door, but they’re equally fabulous. Check rates and more details. The Yucatan had a rich colonial history of sisal-making in the 19th century, and just a short drive from Tulum northwest toward Merida will bring you into the hacienda region, an irrisistably historic area with some grand old haciendas still operating today as luxury hotels. We loved our stay at Hacienda Yaxcopoil, if you’re looking for a truly unique and old Mexico!